Delta paced as she waited for Hob and Gob to return with more… of those wretched things. Mana was already an issue on large spending, Delta couldn’t afford to just turn down a free source of income. Especially when it came with free DP. So, as she waited, Delta pondered the boss room. Having one meant her core had a final layer of protection before someone reached her core, that was good! She’d need to evolve Fran into something else with a pig as a backup to form something she may not want protecting her core. The Mushys were hard enough to look at without fleeing. Seeing one yawning… or just hissing at the air made her ghostly flesh break out in goosebumps. It was also just the idea that having a boss room meant that Delta was… cementing her purpose as a dungeon. Fight the weak mobs, find the loot, beat the boss, level up, and go home. The bread and butter of any good adventure. Except… Delta didn’t have loot… or some grand treasure chest at the end. “I’m not sub-par! I’m still developing,” she assured herself and Fran’s ears flicked as if hearing but choosing not to comment as he enjoyed the new goblin camp. The little guy did look a lot more healthy in the glow of the fire. Delta summed up the life of a dungeon core. 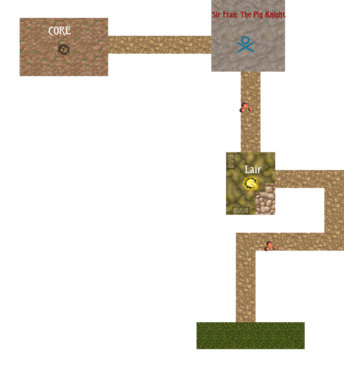 Make a dungeon, lure adventurers, kill them, grow, lure more people. Delta felt like she could maybe… with some effort cut it down to just the lure and grow stage somehow. Far be it for Delta to stop an idiot wandering in here with nothing but a pot on his head and a butter knife. Delta felt bad about luring in the unaware or lost, not the terminally stupid, that was practically doing the species as a whole a favour after all. You don’t feel sorry for the people who set their head on fire and expect to be fine. No, Delta wanted to have people agree to the game of dungeon and goblins. Win and get the shinies, lose and well… thanks for playing? It seemed too hopeful but if Delta could just show those that came near that her dungeon was dangerous and the unprepared should turn around and walk away, then she’d just feel better about the whole defending herself against humanity thing. “Maybe… I can?” Delta muttered and opened the menu to the construction upgrade section. Delta thought about it. She could purchase both the boss room and the entrance hall. Having 2 DP to spare and potentially having way more once her gobs returned. Delta swallowed back more gags and tried to focus. It seemed… that making a boss monster had no actual price and that worried Delta. Nothing good was free in this little new life of hers. Except for mushrooms but they could go die in a fire. Once she got the boss room up and running. There did seem to be no extra steps needed for pushing Fran up to the next level of evolution. Perhaps it was undoable? A one time, no-take-backies? Would Fran be her forever level 1 floor boss? Was that really a bad thing? Maybe down the line, when she had uber-wizards and three-headed frost wolves, it would be but for now, she had two fungi and three goblins between her and smashed-to-bits death. Necessity was the mother of bad choices. Delta purchased both rooms and the boss room flashed red and refused to be purchased. Delta blinked and saw a map opening, her two rooms flashing red. Right… need a room… to make a boss room. A room cost 20 mana and she had 15 going for her. Delta glared at her tiny single mana regen. Oh, the gobs were back, joy. She zoomed to the entrance and saw them carrying more mushrooms but… Gob had something in his other hand. He dropped it and it landed with a thud. “Is that an apple? Gob, where did… you get an apple?” she asked and the goblin shook his hands in defence. “Tree! Climbed with teeth, belonged to no mans!” he promised. Delta watched it fade as her dungeon consumed it. It tasted sweet but Delta braced herself as the dropped more mushrooms. But the apple made her mind spin. “Gob, go bring me a few branches and rocks,” she requested. Delta thought about how her tunnels just banished whatever soil was in the way, she hadn’t seen one rock or root appear in any of them. Just hard packed soil. The apple finished fading and her menu popped up. Apple consumed. New menu unlocked. Delta closed her eyes and then opened them again. Nope, she could indeed magic food out of thin frigging air! “Why?” was her first question. It was a good one, she allowed. Why would she, a dungeon with no stomach or her monsters… who didn’t seem to needed to eat… need an apple? It seemed a rather odd thing for her dungeon powers to have. Would she be able to plant them and turn them into some kind of apple fiend? Exploding apple traps? Goblins throwing apples?! Delta closed the box and put the thought to rest as Gob returned. He dropped the two branches and some stones on the ground. Delta watched with interest as the items vanished. Her mana was now 22, the apple giving her a whole 2 mana compared to the single 1 of the mushrooms. Was it because they were more healthy? Or did the world hate the mushrooms as much as Delta did? Delta rubbed her ghostly hands as she quickly made another hallway shooting west from her core room and a new room to cap it off. That quickly brought her down to 2 mana. Her menu popped open as she finished up. Wood functions added to ‘Construction’ and ‘Trap’ menus. Stone functions added to ‘Construction’ and ‘Trap’ menus. A quick flick through saw some changes. Her torches could be made of tiny lumps of stone on the wall instead of wooden sticks now. No cost increase since it didn’t seem to be much better quality. However, as she peered at the purchase menu she saw something very different. Stake trap: 10 DP: covered sharpened sticks designed to ruin boots and hurt feet. Delta looked at the list and saw several options before that was DP cost only now had a mana cost as well, allowing to choose to spend mana instead of precious DP. Did supplying materials ease the burden of creation? By choosing to gather resources instead of simply waiting for her Mana to build, did she circumvent the one time cost with mere effort? Delta wanted to giggle at the absurdity. Fran made her feel like she wasn’t the only dungeon around. Did other dungeons do this? Surely… Did they? Then again, how many had access to contracted goblins and a forest? She hummed as the Hob and Gob ran back out. “Something other than mushrooms!” she called but wasn’t sure they heard her. Ah well… who knows? Maybe they’d find some burgers or some soda? A girl-turned-dungeon-core could hope. She quickly paid the fee to move her core to the new room and felt a little tingle of excitement grow as the orb floated gently down the new tunnel. From 69 DP to 59 which left her plenty to play with. As she waited for the Core to fully move, Delta spent 10 DP at the entrance. It made her giddy… almost ecstatic to see the world shift at her command. Delta liked improving, she liked growing. She had to wonder how much of that was built into her and how much was her human mind trying to understand the sheer impossibility of her current existence. The simple cave-like entrance bulged as it became more like a doorway, arched and high. The tunnel immediately closest to it hollowed out on either side, making a space big enough for five people to stand comfortably. The ceiling domed up a little, making the space feel open and letting a bit of a breeze float down the down. The little chamber shuddered as two wooden beams formed on either side of the door and then across the top. Delta’s eyes glazed over as she saw from a distance, the outside of the new entrance… had a single space above the hole. It prompted Delta to say add something… words… a warning. Delta shuddered as she focused on the words she wanted to be carved into the wood. Well… here she was world. Dungeon Core Delta. On the outside, challenging the world, the tiny hole in the ground had three words carved into the wooden plank above the entrance. It simply claimed one time. Thanking the two gobs, she sent both of them back out. They seemed to enjoy the gathering missions so Delta left them to it. Besides, she was excited to do the next project. Before Delta left, she made two torches on either side of the little chamber, her last two mana gone. Like running water, the soil ran down-and-out before it hardened into simple wooden sticks. Then as if some deity spoke, the tips burst into a weak flame that lit the chamber up enough to just show how dark the tunnel ahead was. If the warning and the creepy darkness didn’t keep people out, then Mushy deserved some fun. “Doing a great job!” she praised as the first Mushy wriggled. It listened and then after a moment… hesitantly thanked her for the praise. It felt gruff and rather startled by having to actually talk to her. “Okay! Right,” Delta said brightly, fleeing down the tunnel before she had to force more interaction with it. Delta wondered if she could ever make cute monsters… not that she disliked Mushys or her gobs… she just wished she could have something that didn’t look like it was designed solely for ripping throats out of people. She came to her empty room and flexed her fingers. Delta was honestly more curious than anything about what would happen. Would a door appear? Would the intruders need to find some skeleton key to gain entrance? Delta clicked purchase and watched as her DP drained and the room pulsed before it stilled. “Uh… where’s my boss room?” she demanded and the map opened to cheerfully show the room now had a skull symbol on it. That meant boss room, apparently. “So… this is what I get? Nothing happened!” Delta sulked. She opened the menu to see that Fran was able to evolve due to an empty boss room. If she tried to get over her mushroom gag reflexes and got on well with one of them… would that change anything? Shrugging, Delta hit the evolve button. Fran came zooming into the room, yelping as he was pulled by some invisible magnet. “Master! I serve!” he yelled as he landed in the middle of the room with a crash. Delta winced as he picked himself up. It shook once and then it didn’t stop shaking. Fran looked around with amazement as the ground under his feet glowed. “I… a boss?” he asked with a faint voice. He sniffed as the light travelled up his body. “I serve you until I dust!” he promised, and then he was swallowed by the light and the room followed suit. Delta closed her eyes as the light grew brighter. Then there was the sound of oinking and Delta blinked her eyes open. Her boring room was now far bigger than it should have been. As the dust settled and Delta could make out details, she opened her map and saw the despite the fact the room seemed to have grown about 3x its previous size, the map claimed the actual space had not budged at all. “I… broke space,” Delta choked. The bare soil ground and walls had gone. The floor was a rough coarse dust or sand, mixing in with the soil underneath but never truly spreading too far. Then walls seemed to ripple and spread out as the room stretched, only now did Delta see that all the corners had gone. This was some circular arena now and it even had very rough seats for lost audiences or her gobs. On the far side, Delta saw a crack in the wall that stood out from the perfectly round room. “Fran?” she called and from the darkness came two red eyes. “Master… I serve you,” came a must deeper voice than Fran’s. The oinking returned and from the shadows of the new lair came a giant boar that slowly walked out as if not wanting to startle Delta. The long white tusks, the dark brown fur, the black hooves all looked ready to inflict serious pain. But it was the red eyes that peered out from a single piece of rough armour that covered the pig that made Delta pause. Those eyes did not belong to a wild animal. On top, almost missable upon first glance, sat an armoured figure. The slight gaps between hands and wrists, body and neck showed green skin. In one hand, a giant crude metal spear. In the other, the black leather reins to direct the pig. The goblin wore crude plate armour thick enough to actually protect from ranged arrows and most basic blunt weaponry and the occasional sword swing. Delta felt afraid for a moment as if the pig would charge at her. Then she remembered she was a ghost and started to breathe again. “Fran?” she asked and the goblin raised his helmet to show a grinning face. It felt almost right but not quite so Delta tried again. “Sir Fran, the Pig Knight,” Delta smiled as the name felt like the final deal in the whole matter and torches burst into light all around the room, like a roaring applause. “At your service, my lady,” he and his pig bowed as one. Delta took it all back, her monsters were adorable. She hid a smile as the pig bowed too low and Fran fell off, face-planting with a growl. The village of Durence moved on with its life. A man bargained with the baker, haggling the price of his wheat down as the tiny fire crystal at the back of the baker shop supplied heat to the ovens. A woman handed the bucket to a pulley system that a water pump drew water up into. The machine whirred and steam hissed out as the pump cooled. A man argued with a woman as she demanded help. “He’s been gone for almost half the day, his family is worried. Mr Sawn never leaves his farm or his family for long. He’s not even done his cow milking yet,” the woman huffed and the man sighed. He ran a hand down his wrinkled jacket. The blue thing being passed from one generation of Peace Keeper to another. In a town this size, only one was ever really needed. “I can take a look about but Pinny, the man is an adult. If he went for a walk or found some peace finally, it’s not our place to poke our noses in. I got enough trouble with Headger melting his potion room wall and seeing his neighbour bathing, the husband is furious. Mrs Willings has gone and angered some pixies down the road and now her house is infested. I don’t think we need to call the king down for a man who's been missing less than a day or so. Jonnie and the boys hunted some gobs down, maybe one messed with his fence, you know Sawn keeps a Fire pistol handy,” Quiss assured the woman. She soured her face then reluctantly agreed, her eyes lit up a moment later. “Did Headger really see Gody naked?” she whispered with delight and Quiss, only Peace Keeper in Durence, sighed. He sent a pray above for anything to take his attention away from the nags and the gossips. She slid down the wall as the tiny box in front of her glowed with pride. Due to consumption of mass poison mushrooms, level 1 has ‘Mushrooms’ freely added to the decorations and will now sprout on their own in the dungeon for free! Poison is reduced from deadly to mildly toxic to avoid Mana consumption. You can upgrade this later! Then before Delta’s very eyes. A little mushroom poked out of the ground. It wriggled and then stilled, enjoying its new home. Then a new box appeared. Mushroom Grove room unlocked! Cosmetic room with no bonuses. May build the room, regardless of max rooms per floor! Just finished reading to the 35 chapter on SpaceBattles. Just wanted to say that I loved it and can't wait till it is completely uploaded here! a room with no limits on building you say!!!! Thanks for the story so far and this "a bit of a breeze float down the down" should be "breeze float down"
I don't understand why she moved her core from the second room to the third as with her current growh rate she can have quite a few more rooms very quickly so why not wait and move it later? In this "It prompted Delta to say add something" you should take out "say"
[Delta moved back to her first bend and threw down a pitfall trap. It left her with 14 over, after a moment's thought, she created an another Mushy in her core room, bring the total mana to 21.
weird,why I feellike you make a wrong match here (and the next few chapter) ? Chokes, oh that poor girl.....lol. Thank you for the chapter, loving reading your story now.